The modern digital workplace is an environment being driven by employees who need to work and collaborate seamlessly. Modern communications and devices provide users with the ability to access business services and applications at any time, beyond the office, from any location. This is the modern digital workplace. 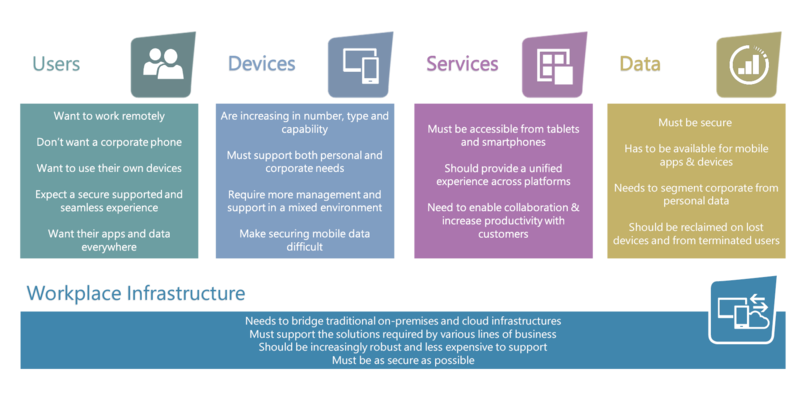 To reach the modern digital workplace involves a journey, which has a unique starting point for each company. Some organisations are just setting off and others are part way through the transformation process. Quorum can support you at any point on this journey. With organisations increasingly providing access through non-corporate devices, the need to control access becomes more important than ever. This involves the protection of your corporate and your customers data. Quorum’s digital workplace solutions are built on Windows 10, Office 365 and Microsoft’s Enterprise Mobility and Security suite. We can also offer access through Citrix cloud hosted Virtual Desktop Infrastructure (VDI) and Remote Desktop Services (RDS), mobile devices and supported browsers. Our consultants are able to work with you and your business to tailor the solution to your needs no matter your starting point on the journey to creating a Modern Digital Workplace. Talk to us about your IT challenges in creating a modern workplace. Our consultants can help you stay on the cutting edge of technology and achieve business innovation.